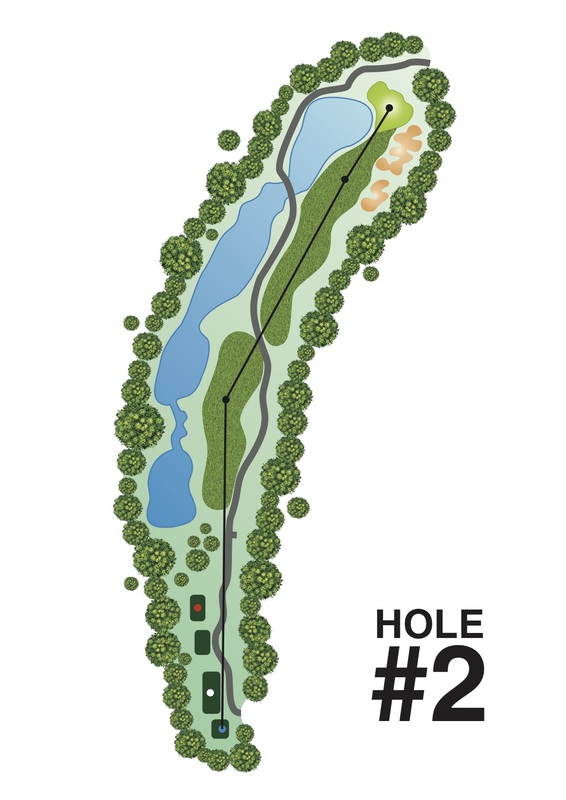 For all but the really long hitters, this hole will play as a true par 5 hole requiring 3 well placed shots to reach the green in regulation. The slope down from the protective mound on the right of the tees tends to direct the suggested playline further left than is actually the case. The player must beware of that as well as the small pond short and to the left of the drive target area. Beyond the drive target zone, a lake guards the entire left side of the fairway all the way to the green whilst to the right very large bunkers guard the approach to the green. For the great majority of players’ placement of the second shot to a point of the fairway short of the bunkers that allows a full wedge or other lofted club to the green, is the best option. The rear left pin is the toughest direction of approach but rise may be made of downslope from right to left pin positions to approach a pin in that location without necessarily risking flying over the water.